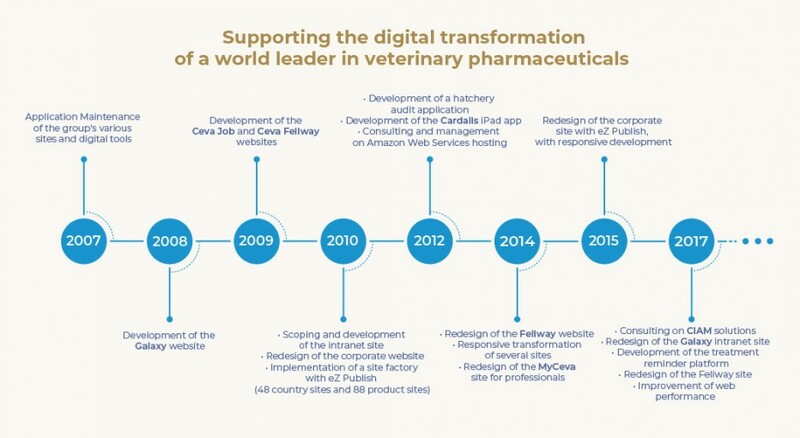 Driven to innovate and with a proven record of double-digit growth, Ceva Santé Animale is one of the fastest growing top 6 veterinary pharmaceutical groups in the world. Ceva specializes in all animal farming industries and in particular poultry, swine, livestock, pets and horses. The Ceva Group is present in 45 countries and has 12 R&D centers, 25 production sites and more than 5000 employees worldwide. The collaboration between Ceva and Clever Age began in 2007 with the takeover of application maintenance for the group’s various sites and digital tools. After this initial collaboration, the pharmaceutical firm entrusted Clever Age to develop a series of sites: Ceva Galaxy, Ceva Job and Ceva Feliway. In 2010, the collaboration accelerated with Ceva’s project to set up a new intranet site and redesign the group’s corporate website. Between 2010 and 2018 Clever Age completed over ten digital projects including the design of mobile apps, the implementation of Responsive Web Design and the development of a site factory. 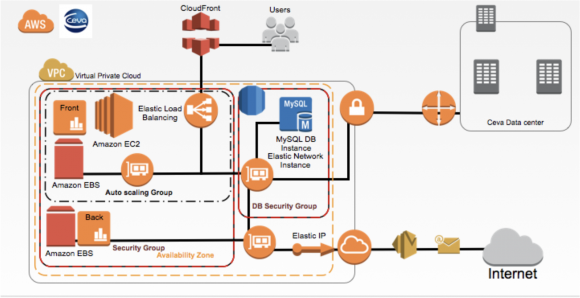 In addition, Clever Age has provided its expertise and built web architectures for deployment on the Amazon cloud. 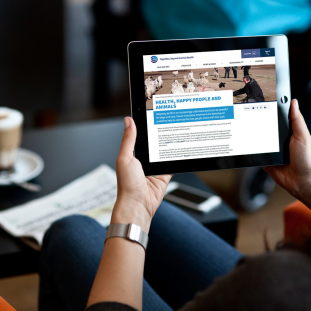 With its worldwide presence and broad range of products, Ceva wanted to improve its online visibility. To achieve this, Clever Age set up site factories allowing Ceva to rapidly expand its digital presence while keeping costs under control. The various site factories developed with the eZ Publish CMS make it possible to deploy a site for a specific country in just one day of development and configuration + three days of training and content updates/translations. Ceva has been increasing its worldwide presence and the site factories have been very effective in making this an easy process. Nearly 45 countries use their showcase sites, while some of the 30 product sites are available in about 30 languages. All the boxes are checked: rapid worldwide deployment of cost-effective sites, supported by a contribution interface shared across all sites, and based on a common technical foundation. In 2014, Ceva country sites were redesigned taking into account the fact that their users are primarily field workers (farmers, inseminators…) who are likely to access content from their mobile phones. It was clear that the website needed to be fully adaptive on all types of devices. The website needed to immediately convey the connection between humans and animals. With this in mind, the design team used artwork related to the world of agriculture and farming, in full width across the entire site. Performance requirements for the site also influenced its graphic design (clean layout, lightweight solid-color backgrounds…) so as to facilitate access via mobile devices where fast Internet connections are not available. Clever Age is supporting Ceva in the development and implementation of two mobile apps for programs deployed on a global scale. This application can be used to monitor lung lesions, to review and consolidate results, and to archive and send the final result. Cross platform development using the Titanium framework means that there is a single source code, making it possible to offer this application on both iPad and Android. To help monitor vaccination programs, Ceva Santé Animale launched in 2009 a special scheme called the “”C.H.I.C.K. Program”” (Ceva Hatchery Immunisation Control Keys) to supervise good vaccination practices for chicks. The application was also developed using the Titanium framework and is available on iPad and Android tablets. The web services were developed with the Symfony™ framework coupled with an Oracle database. After many years of using traditional hosting solutions for its servers, Ceva decided to turn to a major player in the hosting industry: the AWS Cloud. Clever Age was entrusted with the implementation of the entire platform and has been overseeing its stability since 2012, as well as performing all the necessary upgrades required by the Ceva web platform’s growth. The platform’s reliability increased considerably thanks to this DevOps approach, since all processes are managed and known by Clever Age. This also helped reduce server costs. In a drive to control costs and to fully leverage the capabilities of Amazon Web Services, Ceva is pursuing its DevOps approach in 2018 by assigning Clever Age with a complete overhaul of its web platform to evolve towards a Docker-based Microservices platform.